Manufacturer of a wide range of products which include cone yarn dyeing machine. Our name is enlisted amongst leading manufacturers, suppliers of wide array of Cone Dyeing Machine / HTHP Package Yarn Dyeing Machines. 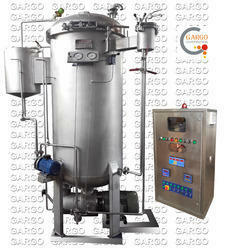 HTHP Dyeing Machine is used for dyeing yarn at high temperature and high pressure. Our offered machines are reliable, durable and robust in construction, as we manufacture these using best in class raw material. We dye many substrates including textured and spun polyester and various blends of these fibers. The body of the machine is fabricated using high grade stainless steel in order to assure durability and resistance to corrosion.